It is perfect for students on the go, parents who want to feed them, or anyone who just needs packable tasty treats to accommodate a busy lifestyle. 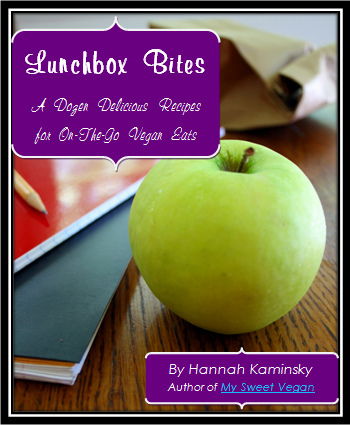 This collection includes a dozen easy dairy-free / egg-free recipes, created by Hannah Kaminsky, the author and photographer of My Sweet Vegan. It is perfect for students on the go, parents who want to feed them, or anyone who just needs packable tasty treats to accommodate a busy lifestyle. For just $5, you will receive the following recipes (each with accompanying full color photo) direct to your inbox: Best Bran Muffins, Brownie Bites, Chipsters (cookies), Coffee-Buzz Energy Bars, Hummus Crackers, Peanut Butter Bomb-Shell Blondies*, Peanut Butter and Jelly Toaster Tarts*, Pie Cups, Root Beer Pudding, Steel-Cut Oatmeal Cookies, and Strawberry Crispy Rice Treats.